Welcome to January's Winter Project Link Party! 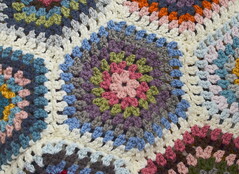 I'm sharing the main crochet project I'm working on this winter, an afghan made with the Larksfoot stitch pattern. I call my blanket Hensfoot, in honor of my chickens. It's growing rather slowly, especially since the holiday season kicked off. I didn't have much time to work on it, but when I did, it was a nice break from the chaos. Now that we've reached January, which is usually a pretty productive time of the year for me, I know I'll be working on Hensfoot more often. I've added another six or seven inches to the length since the last link party. I think this is good progress, but I have a long way to go if I'm going to have this blanket finished by spring. That's fine with me, though; I enjoy working on it and it's always nice to have my blankets grow down my lap and legs as I work, especially in the winter. It feels particularly rewarding this winter, since we're having a colder winter than usual. I love crocheting afghans of any kind but I always seem to come back to striped ones. There's just something very fulfilling about moving back and forth across the rows, side to side, front to back. I like to look at my stripes from all angles. Do you do this too? It's sort of hypnotic to me. I'm still working semi-randomly with my colors, just to spread them out. I do try to make sure colors look nice next to each other, but I think most of them work pretty well. 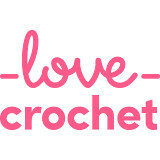 There are no very few mistakes in crochet, right? My yarn supply continues to dwindle, the basket becoming a little easy to carry all the time. It feels good to get through some of my stash and make something pretty and useful in the process. How about you? What are you working on this winter? Are you feeling stuck, or bored with your projects? Or have you made excellent progress? Please join in with the Winter Project Link Party, even if it's summer where you are. Share a link to a blog post about your winter projects and visit others' blogs to check out their projects and offer encouragement. Please be sure to link back to my post to help spread the word about this link party! That looks really great, liking the pattern. Have a nice week! It's looking lovely, I love the random it is working really well :). Thank you for hosting this lovely link up again! I knitted a scarf for Olly's toy fox!! Your blanket's coming along really well, such lovely colours. I don't mind taking my time over a project, I like to enjoy the process rather than rushing through it. The blanket is looking marvelous! Beautiful rich colours :) I'm afraid I haven't progressed at all with my project due to Christmas craziness. I'll have to give the party a miss again for January, but will now have time to show some progress next time! It's coming on and looking good. Your colours are stunning together. Jennifer, your blanket is looking so beautiful. I won't link this time because I didn't work on my blanket at all this month. It's been blooming mittens around here this month! Gorgeous blanket!! Wish to do one somewhat like this someday in the future. Wishing you a great new year in 2016! Thank you for all the enjoyable blog posts. Oh I was going to ask, what type of yarn do you use in this project? Wool? I'm loving the colours of your blanket. It's nice to see your basket of yarn too. I love a basket of yarn, there's something very homey, comforting and welcoming about them. I'll be joining with the link party soon! Oh that looks very good, and coming along so nicely. You are doing such amazing job, I love the colours. January is always such a productive month so I am hopeful that I will get a lot more done. Thank you for hosting. Jennifer, thank you for the nice comment in my blog! Happy New Year! Lovely greetings from Latvia and Riga. I love the colors in your blanket and the stitch you chose. 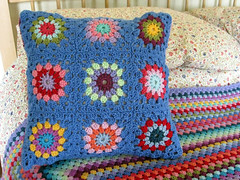 When I see projects like this, I'm determined to learn how to crochet. I would love to be able to make something similar. Hi Jennifer. New to your blog here. Lovely place to visit. I just joined in on your link party. How fun! Lots of lovely makes here.